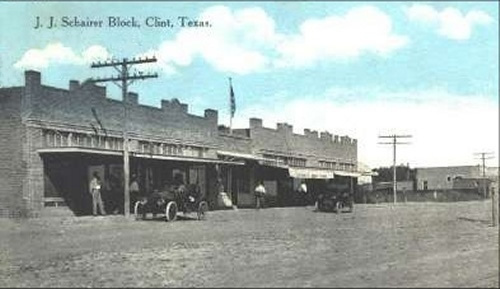 The Clint post office was established in 1886, but the town was known as San Elizario Station since it was on the Galveston, Harrisburg and San Antonio railroad line. 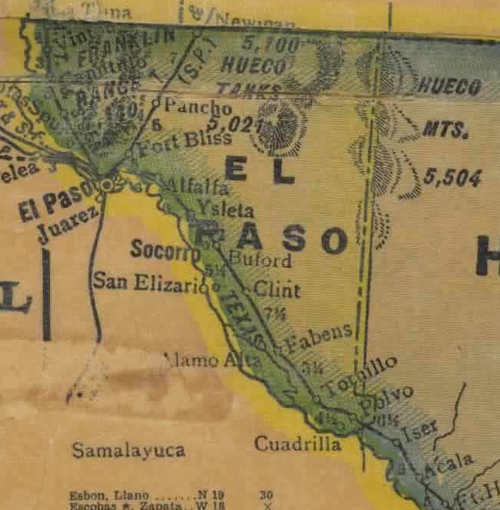 The San Elizario Corporation (see Salt Flat) sold the land to a J. Cole who sold it to Thom. Collins in 1883. Thomas' wife was Mary Clinton Collins and it is she that the town was named after. According to the Handbook of Texas Online, Clint had a population of 100 people more or less in 1890. They report that the town at that time had a general store, a fruit grower and a hotel. We suppose the hotel put people up while they waited for the fruit to ripen. Although no mention is made of what fruit was grown, by 1896, eight more people were growing it. The ups and downs of Clint are reflected in its census. 600 people in the 20s - 250 in the mid-30s - 550 in the 40s and down to 417 in the early 70s. Sometime in the 70s they welcomed the 1,000th citizen and in the late 80s it was 1,883. We hope someone will inform us of the latest census figures. In 1990 it was 1, 035. Our thanks to Mr. Garza who recommended Clint for inclusion.